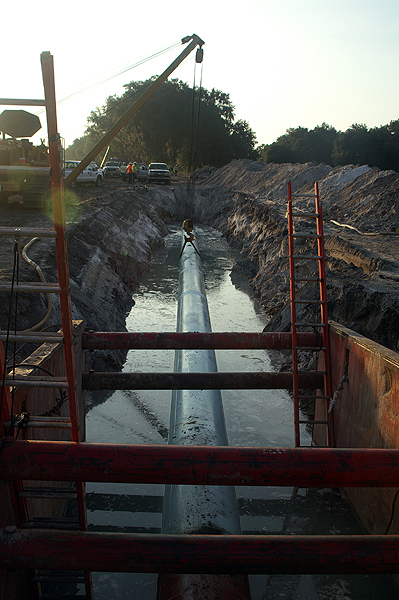 One of the serious problems of constructing a pipeline through Florida is the high groundwater levels. There are requirements regarding how deep the pipe has to be placed for safety reasons. When this trench was excavated to the required depth, it hit the groundwater. Pumps will have to be installed to pump the trench dry before the pipe can be installed. Filtration areas for each discharge pipe from the pumps has to be constructed to ensure that the discharge water is sediment free. This entry was posted on Saturday, June 9th, 2012 at 10:31 am. It is filed under Collections, Landscape and tagged with groundwater, pipeline, right of way, trench, water. You can follow any responses to this entry through the RSS 2.0 feed.